If you had China on your radar, your chance is NOW. You can get a return ticket to Beiing for a mouth watering INR 20k return, with full service airline, Srilankan. This is for select dates in late 2018 and you have to act NOW before they are gone. Try between late November and early December. Under normal conditions, a return trip to Beijing will cost about 40k. Even with best price on AirAsia during its big sale, it is usually around 25k onwards. With a full service airline like Srilankan, it is a steal- baggage, meals included. But note that the amount will be non-refundable. No date change, no refund is applicable if you can’t go. So be sure that you can travel as planned. 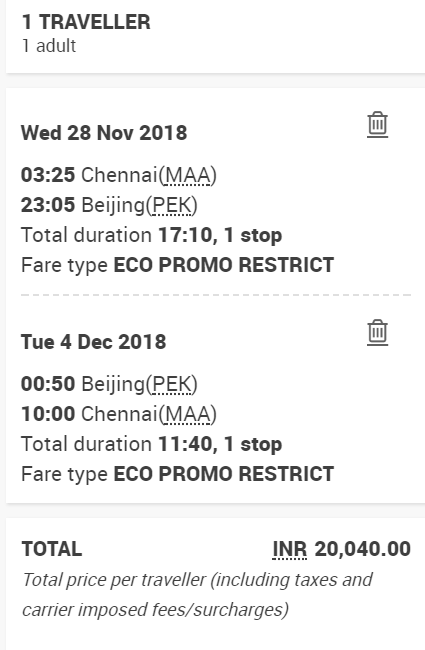 Note: Delhi-Beijing return available for similar fare on Singapore Airlines.